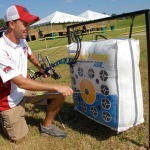 Editor’s Note: Nathan Brooks from Alma, Arkansas, has won the IBO (International Bowhunting Organization) Triple Crown team championships, numerous individual tournaments on ASA’s (Archery Shooters Association) Pro Am tours and the NFAA’s (National Field Archery Association) national championships back to back, is an avid bowhunter and is on PSE’s Pro Staff (http://pse-archery.com). Today, Brooks coaches tournament archers and believes that any bowhunter who wants to become better should shoot tournament archery. 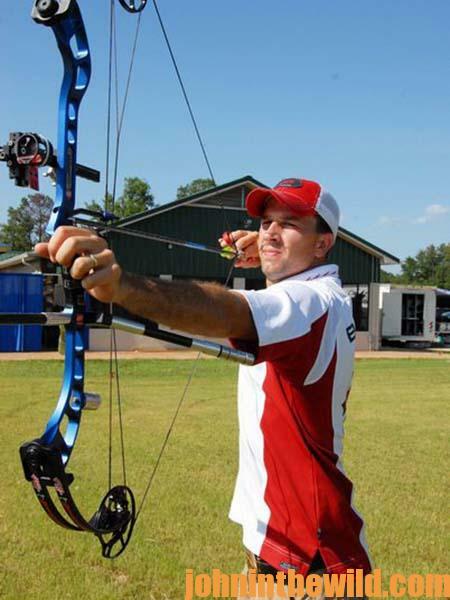 For many years, the bow I shoot in 3D archery tournaments is the same bow I’ll use for hunting. But other years, I’ll have one bow for shooting tournaments and a different bow for hunting, depending on what new bows PSE produces that year. This coming season I’ll be hunting with the PSE Full Throttle, but I won’t be using that bow for any competition shooting. The Full Throttle is a super fast, really aggressive bow. I like a super fast bow for my hunting bow not to deliver the arrow to the animal faster, but to shoot a heavier arrow faster. My 3D bow, the PSE Freak (http://pse-archery.com), is quite a bit longer than the PSE Full Throttle, but it’s still fast. 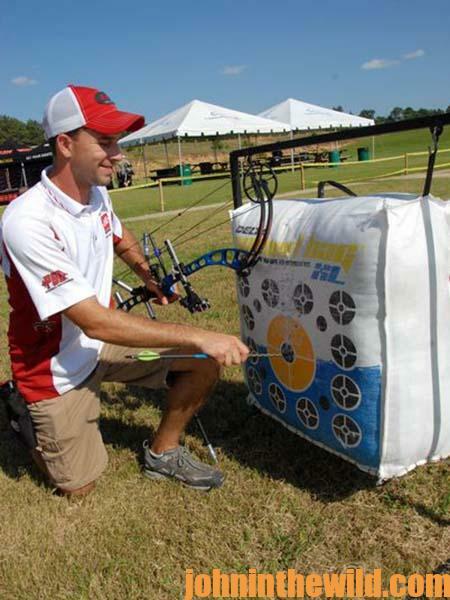 I like the Freak for target archery, because I believe the longer frame gives me more stability when I take the shot. It also has more forgiveness built in than the Full Throttle does. The PSE Full Throttle is much shorter than the Freak and quite a bit faster, making it more maneuverable in the tree stand, but I don’t give up any accuracy. When I’m shooting the Freak in IBO tournaments, I’m shooting 315 feet per second. When I’m shooting an ASA tournament, I shoot 295 feet per second. For indoor tournaments, I’ll be shooting 250 to 260 feet per second. 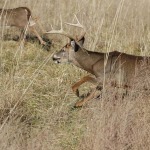 Many bowhunters want as much speed as they can get out of a hunting bow. 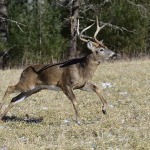 So, they’ll often shoot a light arrow and a light broadhead in a really-fast bow to get that speed. Right now, the PSE Full Throttle is the fastest bow in the market. I easily can get speeds of 350 feet per second out of the Full Throttle, which is insanely fast for a 29-inch draw length. I prefer to shoot a heavier arrow instead of shooting a super-light arrow and broadhead. 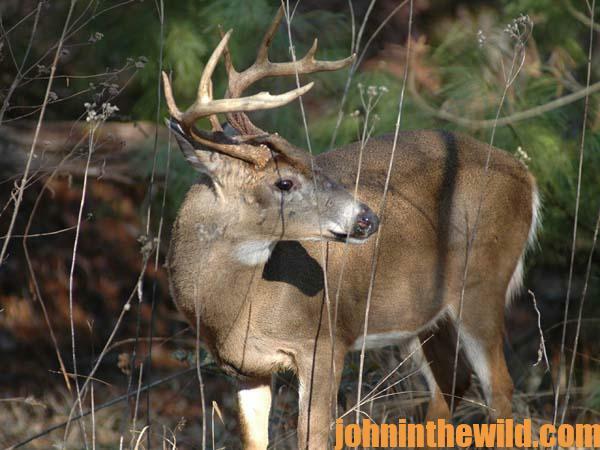 I know many bowhunters are shooting mechanical broadheads and light arrows, and they get a tremendous amount of speed. But unless the hunter is super-accurate, that set-up won’t deliver a lot of penetration. 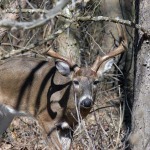 The shot that I made on the Kansas deer would have been a no-shot for me, if I hadn’t had a heavier arrow and broadhead. That deer weighed 250 pounds field dressed. I was attempting to drive the shaft and the broadhead almost completely the length of the deer. 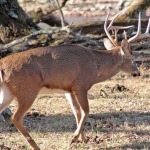 If I’d been shooting a mechanical broadhead on a light arrow, I really don’t believe that I would’ve gotten enough penetration to drive the arrow from high on the tip of the deer’s hindquarter all the way through the body of the deer and have my broadhead sticking 3-inches outside the deer’s chest. This reason is why I prefer to shoot a fixed-blade broadhead, instead of a mechanical broadhead. 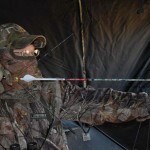 I shoot a NAP (New Archery Products) HellRazor (www.newarchery.com), which is a fixed broadhead. My arrow shaft is about 500 grains. I’ll give up speed for penetration. However, with the PSE Full Throttle, because it’s so screaming fast, I don’t give up very much speed to get the penetration I want. This year, I’ll have a PSE Phantom Drop-Away Rest, a fully contained arrow rest on my Full Throttle. It holds an arrow well, and it’s extremely accurate. Since it’s a PSE product, it’s designed to fit well on a PSE bow. I’ll be shooting an Easton (http://www.eastonhunting.com/) Full Metal Jacket arrow shaft and the CBE (Custom Bow Equipment) Sniper Pro X sight (www.custombowequipment.com). I like this sight because it’s quickly adjustable. I set it up with three sight pins to shoot out to 100 yards fairly easily. I’ll have a 20, 30 and 40 yard pin. Because I have an adjustable sight, I can shoot accurately out to 100 yards. My hunting release is the Scott Longhorn Hex Release (www.lancasterarchery.com). This is a wrist strap release with a hinge design. My target release is a Scott’s Black Hole Release, also a hinged type release without a trigger. So, my hunting release is very similar to my target release, except my hunting release has a wrist strap, and my target release doesn’t. I like the wrist strap release for hunting, because if I’m bowhunting and drop my release, I need the confidence of knowing the strap will stop it, and I won’t have to climb down the tree to recover my release. When I’m shooting target archery, I drop my release quite frequently. I shoot a Doinker 12 inch stabilizer (www.doinker.com) on my hunting bow, because when I shoot, it cancels out much of the noise and vibrations from my hunting bow. I also put the little rubber cat whiskers on my string to help cancel out some of the noise. I use Alpen’s Rainier binoculars (www.alpenoptics.com) that are fog resistant. You won’t find a pair of binoculars that’s any clearer than the Alpen Rainiers. They have plenty of magnification power, they’re comfortable to carry, and they’re easy to use. I wear Mossy Oak camo (www.mossyoak.com). 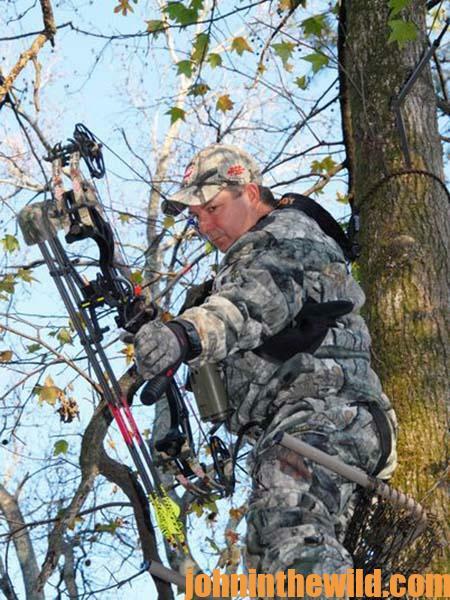 The pattern I wear depends on where I’m hunting, and the time of year I’m hunting. To get John E. Phillips’ Kindle eBooks, “Bowhunting Deer: The Secrets of the PSE Pros,” “How to Hunt Deer Up Close: With Bows, Rifles, Muzzleloaders and Crossbows,” “PhD Whitetails: How to Hunt and Take the Smartest Deer on Any Property,” and How to Hunt Deer Like a Pro,” or to prepare venison, get “Deer & Fixings.” Click here to get these books.